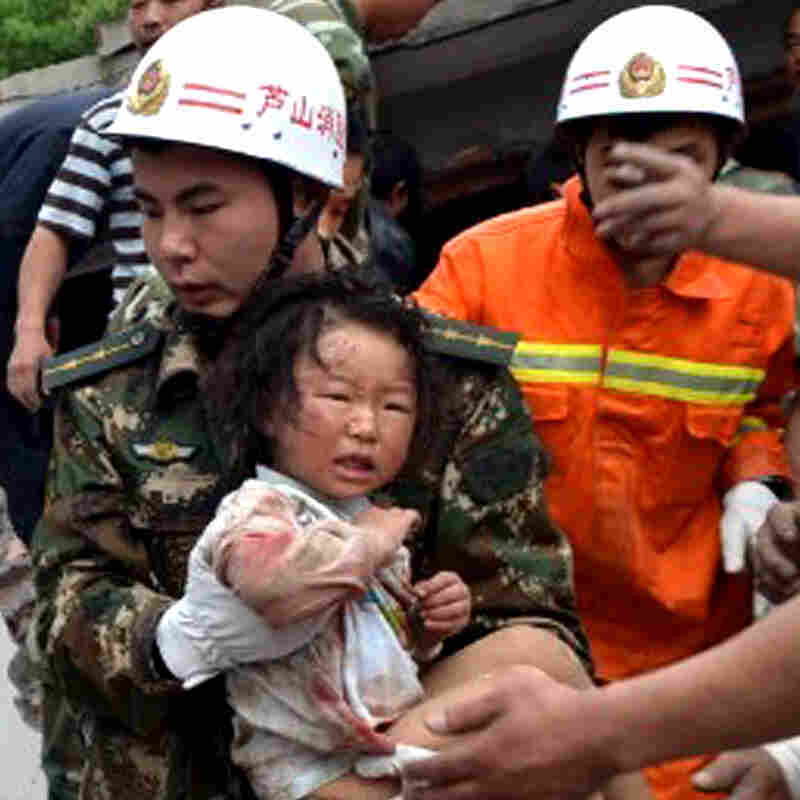 Strong Quake In China Kills Dozens, Injures Thousands : The Two-Way The quake happened near the site of the devastating 2008 temblor that killed more than 90,000 people. A rescuer carries a child to safety after she was pulled out of her collapsed home after an earthquake hit Ya'an City in southwest China's Sichuan province on Saturday. "A powerful earthquake jolted China's Sichuan province Saturday near where a devastating quake struck five years ago," The Associated Press writes. According to CNN, early estimates put the death toll around 100. More than 1,000 other people were reportedly injured. Both figures could change substantially as more information comes in. Reuters, for example, is already reporting that the number of injured may top 2,000. The U.S. Geological Survey puts the estimated magnitude of the temblor at a strong 6.6. There's been a series of aftershocks since the initial quake. As the AP reminds readers, "the area lies near the same Longmenshan fault where the devastating 7.9-magnitude quake struck May 12, 2008, leaving more than 90,000 people dead or missing and presumed dead." All Things Considered was on assignment in Chengdu, China, when that devastating quake hit in 2008. It's coverage is collected here.